My brother has been raving about his fiancée making Zucchini Au Gratin so I thought I might give it a try. I’m not sure of her exact recipe but here’s my take on it. It’s easy and low carb too. Preheat oven to 375 degrees (F). Grease a 9×9 or equivalent oven proof pan. Overlap 1/3 of the zucchini and onion slices in the pan, then season with salt and pepper and sprinkle with 1/2 cup of shredded cheese. Repeat two more times until you have three layers and have used up all of the zucchini, onions, and shredded cheese. Combine the garlic powder, butter, and heavy cream in a microwave safe dish. Heat for one minute or until the butter has melted. Stir. 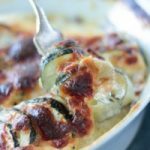 Gently pour the butter and cream mixture over the zucchini layers.